Sarajevo as we know it today was founded by the Ottoman Empire in the 1450’s upon conquering the region, with 1461 typically used as the city’s founding date. The first known Ottoman governor of Bosnia, Isa-Beg Ishaković, chose the tiny local village of Brodac as a good space for a new city. He exchanged land with its residents, giving them today’s Hrasnica neighborhood in Ilidža, and soon began building his provincial capital as he envisioned it. He quickly built a number of key objects, including a mosque, a closed marketplace, a public bath, a bridge, a hostel, and the governor’s castle (“Saray”) which gave the city its present name. The mosque was named “Carova Džamija” (the Emperor’s Mosque; the Imperial Mosque) in honor of the Sultan Mehmed II. If you want to spend a day learning about Sarajevo rich and turbulent history our Invicta Travel Sarajevo guides can take you on amazing and informative 2 hours long Sarajevo walking tour. This Sarajevo tour include a beautiful walk through streets of Sarajevo and our Sarajevo guides will explain you all you need to know about the city. Invicta Travel main mission is to bring beauties of Bosnia and Herzegovina even to the farthest places of the world. Invicta Travel agency is promoting this country and especially Sarajevo tours through the knowledge of our Sarajevo guides. Let’s go back, way back to 28th June 1914, the day that saw an event which kicked off World War I and changed the world forever. You can stand on the corner where Gavrilo Princip, one of five freedom fighters/terrorists who plotted to kill the Archduke of Austria-Este, Franz Ferdinand. Our Sarajevo guides will explain you about this interesting story which is considered as the main trigger of the World War I. You can find this tour under Sarajevo tours section. The architecture of Sarajevo is just as interesting as the history. You’ll see a mix of grand and ghastly! Austro – Hungarian craft sits side by side with the ‘function over frills’ soviet style bland buildings. 60% of the buildings in Sarajevo were damaged during the ’92-’95 siege. City Hall was reconstructed and is an important symbol today. Our Sarajevo guides have very interesting stories to tell you about the construction of this famous Sarajevo landmark. City Hall did not always sit on that spot at the start (or end) of the Old Town. Previously a little man’s house was in the prime location but the Austrian – Hungarian monarchy wanted it. Like most men with power do, they tried to make this man move but he was stubborn. He finally caved into the negotiations with the result that he was paid handsomely and his modest house was moved, brick by brick, over the river Miljacka, directly facing the new City Hall. The House of Spite (Inat Kuća) is now a restaurant. Everyone in Sarajevo knows this true and interesting story about a man VS system. Our Invicta Travel Sarajevo guides will explain you in details more about it. Stroll through the cobbled streets of Baščaršija, grab a coffee or shisha and observe people or buy some trinkets from the cute shops which line the small Old Town lanes. If you want to feel Orient in the middle of Europe, this is the right place to start your Sarajevo tour. One of the prettiest things to do in Sarajevo at night is to take in the sunset and city views (there is a better viewpoint to come) from the Yellow Bastion/Yellow Fortress. You can find this Sarajevo tour in Invicta Travel Balkan’s Dark Side tours. In this tour our Sarajevo guides will take you by car so you can enjoy in the most beautiful view of Sarajevo Old Town. 800 meters of man-made underground tunnel connected the city of Sarajevo with the United Nations ‘safe place’ at the airport. This tunnel was dug by citizens from both sides of the city and took 4 months to complete. The tunnel allowed the passing of medicine, food, and artillery which helped the locals survive and the army fight during the siege. This is one of the most popular Sarajevo tours today, so it’s a must thing to do. 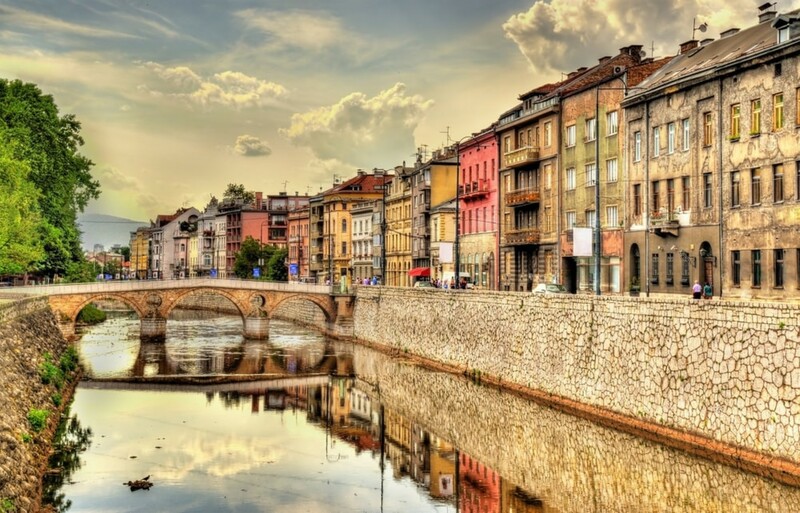 Invicta travel Sarajevo guides have the knowledge and experience for this tour to make it as personal as possible and bring the details of war horrors as closer to you as possible. Did you know that Sarajevo played host to the ’84 Winter Olympics? The bobsleigh and luge track still stands (in most parts) at the top of Mount Trebević Sarajevo, a visit is a pretty unusual thing to do in Sarajevo! The abandoned bobsleigh track was used by the Bosnian Serbs during the siege as a base for their attack on the city. You can see that some on the concrete track has fallen from the grenade impacts. Sarajevo tours also include a visit to this complex. You can also use a Cable car to get here and enjoy the most beautiful panorama view of Sarajevo. Here in Invicta Travel we know the best places to show you and our Sarajevo guides have the knowledge to explain you. Ever popular with local families, the focus of this extensive park is a patchwork of lush mini-islands at the cliff-mouth source of the Bosna River. The classic way to get there is to stroll or take a horse-drawn cart. In our Sarajevo tours we also include a tour to this beautiful park in which our Sarajevo guides will take you through. Here you can enjoy in peace and silence outside from the city noise. While visiting Bosnia’s capital, one thing that cannot be missed is a plate of tasty ćevapi. Ćevapi is the national dish of Bosnia, and is essentially grilled minced beef in a sausage shape, inside a pitta or flatbread with onions and sauce. The sausages are usually small, so one portion is made up of several ćevapi. Another most famous meal in Sarajevo is Pita or Burek. There’s one thing you need to know: Burek is the “King” of all local pies. Burek, one of the most popular Bosnian cuisine specialties, is a meat pie. It is made with minced or finely chopped meat, onion, oil, salt and pepper, all mixed and wrapped in a thin pastry (jufka) which is traditionally rolled out by hand using a long wooden rolling pin (oklagija). While you are exploring Sarajevo, you can also try Sarajevsko beer directly from the brewery. We usually say that you can’t leave Sarajevo without trying our Bosnian coffee, which you can find everywhere in the Old City.You can just ask our Sarajevo guides on your Sarajevo tour where you can taste these Bosnian specialties. Here in Invicta Travel we have all answers for you and we know the best restaurants in town, just feel free to ask.